Intrada Italy creates a beautiful assortment of Italian pewter items. From large pewter bowls and serving stands to pewter plates and trays to glassware and candelabras, the Intrada Italy pewter collection is expertly crafted in Italy. 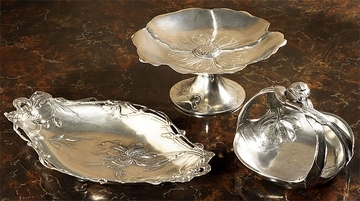 Intrada Italian pewter dinnerware items feature ornate embellishments and attention to detail that only a mature master Italian pewtersmith could do. To be marketed as pewter, each piece must contain at least 92% tin (believe it or not, tin is a precious metal). All Intrada pewter dinnerware and decorative accessories meet or exceed the benchmark. Made in Italy by Intrada Italy.